Nirodha – “Where” is Nibbana? reading the SN on the Khandhas myself I stumbled over one sutta which kept me pondering. In that particular sutta, the Buddha was using nirodho for the cessation of forms interchangeably with the nirodho of the experience of Nibbana. I never had thought this through so when I came across the following passage from Ven. Nyananandas sermons it made “click” and I think more sense now. Bhavanirodho nibbanam, bhavanirodho nibbànan’ti kho me, avuso, anna’va sanna uppajjati anna’va sanna nirujjhati. Seyyathapi, avuso, sakalikaggissa jhàyamànassa annà’va acci uppajjati, annà’va acci nirujjhati, evam eva kho me àvuso bhavanirodho nibbànam, bhavanirodho nibbànam ‘ti annà’va sannà uppajjati annà’va sannà nirujjhati, bhavanirodho nibbànam sannã ca panàham, àvuso, tasmim samaye ahosim. “One perception arises in me, friend: `cessation of existence is Nibbàna’, `cessation of existence is Nibbàna’, and an other perception fades out in me: `cessation of existence is Nibbana cessation of existence is Nibbàna’. The true significance of the simile of the twig fire is that Venerable Sàriputta was attending to the cessation aspect of preparations. As we mentioned in connection with the formula etam santam, etam panitam, “this is peaceful, this is excel lent”, occurring in a similar context, we are not to conclude that Venerable Sàriputta kept on repeating ‘cessation of exis tence is Nibbàna’. The insight into a flame could be different from a mere sight of a flame. Worldlings in general see only a process of burning in a flame. To the insight meditator it can appear as an intermittent series of extinctions. It is the outcome of a penetrative vision. 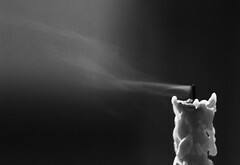 Just like the flame, which simulates compact ness, existence, too, is a product of sankhàras, or preparations. The worldling who attends to the arising aspect and ignores the cessation aspect is carried away by the perception of the compact. But the mind, when steadied, is able to see the phe nomenon of cessation: thitam cittam vippamuttam, vayancassànupassati, “the mind steadied and released contemplates its own passing away”. With that steadied mind the arahant attends to the cessa tion of preparations. At its climax, he penetrates the gamut of existence made up of preparations, as in the case of a flame, and goes beyond the clutches of death. As a comparison for existence, the simile of the flame is quite apt. We happened to point out earlier, that the word upà dàna can mean “grasping” as well as “fuel”. The totality of existence is sometimes referred to as a fire. The fuel for the fire of existence is grasping itself. With the removal of that fuel, one experiences extinction. The dictum bhavanirodho nibbànam clearly shows that Nibbàna is the cessation of existence. There is another signifi cant discourse which equates Nibbàna to the experience of the cessation of the six sense-bases, saëàyatananirodha. The same experience of realization is viewed from a different angle. We have already shown that the cessation of the six sense-bases, or the six sense-spheres, is also called Nibbàna. The discourse we are now going to take up is one in which the Buddha presented the theme as some sort of a riddle for the monks to work out for themselves. Tasmàtiha, bhikkhave, se àyatane veditabbe yattha cakkhum ca nirujjhati rupasannà ca virajjati, se àyatane veditabbe yattha sotanca nirujjhati saddasannà ca virajjati, se àyatane veditabbe yattha ghànanca nirujjhati gandhasannà ca virajjati, se àyatane veditabbe yattha jivhà ca nirujjhati rasasannà ca virajjati, se àyatane veditabbe …se àyatane veditabbe yattha mano ca nirujjhati dhammasa¤¤à ca virajjati, se àyatane veditabbe, se àyatane veditabbe. There is some peculiarity in the very wording of the pas sage, when it says, for instance, that the eye ceases, cakkhunca nirujjhati and perceptions of form fade away, rupasannà ca virajjati. As we once pointed out, the word viràga, usually ren dered by “detachment”, has a nuance equivalent to “fading away” or “decolouration”. Here that nuance is clearly evident. When the eye ceases, perceptions of forms fade away. The Buddha is enjoining the monks to understand that sphere, not disclosing what it is, in which the eye ceases and perceptions of form fade away, and likewise the ear ceases and perceptions of sound fade away, the nose ceases and percep tions of smell fade away, the tongue ceases and perceptions of taste fade away, the body ceases and perceptions of the tangible fade away, and last of all even the mind ceases and per ceptions of mind objects fade away. This last is particularly note worthy. When those monks approached the Buddha and placed Venerable ânanda’s explanation before him, the Buddha ratified it. Hence it is clear that the term àyatana in the above pas sage refers not to any one of the six sense-spheres, but to Nibbàna, which is the cessation of all of them. The commentator, Venerable Buddhaghosa, too accepts this position in his commentary to the passage in question. Salàyatananirodhan’ti salàyatananirodho vuccati nibbànam, tam sandhàya bhàsitan ti attho, “the cessation of the six sense-spheres, what is called the cessation of the six sense-spheres is Nibbàna, the meaning is that the Buddha’s sermon is a reference to it”. If this is the case, if Nibbana is the cessation of the six sense sphere what then is the difference between the cessation of a form, a feeling, etc. and Nibbana? According to this there is none. Let’s continue on this thought for a while. What are the implications? If we take a real life example and reflect how the sound of a bird catches our attention and draws our awareness away from – let’s say – the breathing. What did happen? The tactile-consciousness-and its object “vanishes” and instead the sound-consciousness appears. This transition happens extremely quickly. 99% of people who hear about this might acknowledge it, but have no clue that such a piece of information could be personal experience. Let’s have a look at the vanishing of the first 5er group of grasping. In this moment of feeling the breath there was a form (the physical tactile form) and a feeling (maybe an agreeable sensation) and a perception (perception of something bodily) and a sankhara and consciousness or awareness / knowing of the form by means of name. All of these qualities of one and the same personal experience of one moment of breathing disappeared in that moment where sound and sound consciousness “made themselves present”. What prevented this gap of vanishing 5 groups to be bridged? It is tanha, tanha ponobhavika. Thirst is a description of that state of affairs which can be observed in our life moment by moment. 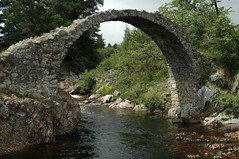 The world is like a crumbling dissolving bridge giving way under our very feet. This spurs a reaction which is thirsting for another hold. This thirst / longing results in another placing of our feet, another upa-adana, another taking up 5 groups. We fear to let go, because it goes against our samsaric nature. We believe that this extinguishing (Nibbana) would mean the destruction of our personality. Vipassana shows us, that there is no such thing in the first place. Also, tanha is described as “sewing”. She sews the “two ends” together. She sews the ceasing existence together with a rising existence. While our physical karmic representation is re-born slower, our 5 group moment to moment experience is a continuous rebirth(*). Anyway, back to that moment where one form vanishes, rupanirodham. Now what would happen if – instead of taking on another new object, our mind would let go completely. Would practice a patinissaggo, a cago. What would it find? What if we were able in this this very one moment not to take hold on another experience. What if we would let go of the last 5 groups of grasping, let go of sound, feeling, thinking but would NOT take up another one. Basically letting the nirodha of an object be a complete nirodha (asesaviraganirodho)? In that one moment the entire chain of existential causality as depicted in the famous dependend origination would crumble and instantaneously dissolve – for a moment. Release and freedom will be felt as soon as we come back. But can we achieve this by will (intention, mental sankhara) or feeling, or thinking, or…. no. According to the Buddha it is only through clear and unwavering observation of ANY incoming object (visual, sound, smell, taste, tactile, thought) that a certain alienation will set in automatically (it is a dhammata, a natural law, says the Buddha). Like someone watching a movie with very strong concentration is dismissing the content, the story of the movie but starts to concentrate on the frames instead. The seeing of each film frame coming and going will make him find less and less interest (nir-vindati = nibbindati, lit. de-finding) and the story will loose its fascination and color (vi-raga, lit. dis-coloring). When the spell of the movie has lost its impact so much that he is able to let go one frame but not take up another, the movie stops. If we would experience this once, if we were able through training and were to develop such an ability to so fundamentally let go of life, this ability would have transformational characteristics. As we know, we would come back, as did the Buddha (our body, the frozen karmic vessel, works as a re-animator). We know that he and his monks could prolong this state through the use of strong concentration states. And while karmic forces and remaining defilements will push us back into the waves of sense impressions we gained an insight which will fundamentally change the fabric of “our” existence. The Tathagata, o monks, the holy one, fully awakened one is called “fully enlightened” because of the (the fact) that he is freed (vimutto, pt perf.) through (case: ablativ, implying “from, because of, through”) the not-finding-anything, the disenchantment, the nirodha (cessation) and not-taking-up-again of form. With other words: He attained release/freedom because he did not take up anything (anupada) after the form disappeared after he was experiencing disenchantment because he got weary of it. This reads like a precise description of all the events which have to take place, one after the other, for our little “thought experiment to work! It is also interesting to see that “nibbida” and “viraga” are crucial for this to work. While i write and while you read this text all the time there is a constant nirodha going on. But neither of us “knows” this. We are wrapt in an ignorance – the ignorance of how this story is fabricated – we are concentrated on the delusional content. If we, however, would apply our sharp tools of vipassana meditation our viewpoint (cmp. Ven. Nyananandas beautiful parabel of the magic show) our point of view would undergo a slight but important change. Now we would see & experience the form vanish, but with out the haste and desire to grasp another one. 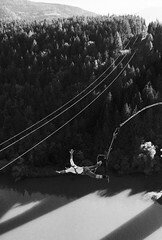 It is like bungee jumping without rope…If you would fear such a jump or desire to be safe or even desire to die – you would find your leg bound by a rope…but if you were simply able to “not care anymore” for any form, feeling, etc. even consciousness then then suddenly the jump would occur without a rope. Jumping and letting go – this is nirodho & patinissaggo or nirodho and anupada. The result is vimutto – freedom. By the time we have trained this ability to the extent of an Arahant, once this bodily physical representation of our karmic flame vanishes (the slowest changing part of our 5 groups of grasping machinery) our consciousness will take no other hold and the nirodha of the last sense experience in that life will be a complete nirodha of samsara. Even better: During our life time we can again and again enter this “state of fruition” or “phala-samapatti” and enjoy its peace and freedom by slowing down the movie or letting it disintegrate without fear or hope or thirst for more. (*) Apropos rebirth: Think of the body as the candle and the flame the remaining 4 groups of grasping. When the candle is burned out it topples and sets on fire a new candle. The flame however – which keeps the fire burning, nourishing on the wick of sense contact is burning from moment to moment. When the candle falls but there is nothing burning in that moment, no new candle will be lit up. Die Sieben Betrachtungen der Einsicht.